Looking for a dairy-free alternative to the most popular appetizer around? 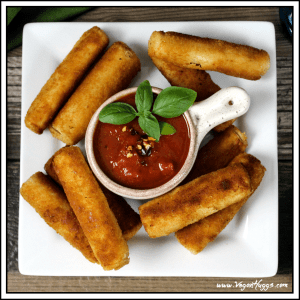 Well, you’ve landed in the right place, because these Vegan Mozzarella Sticks are crispy, tangy and delightful. 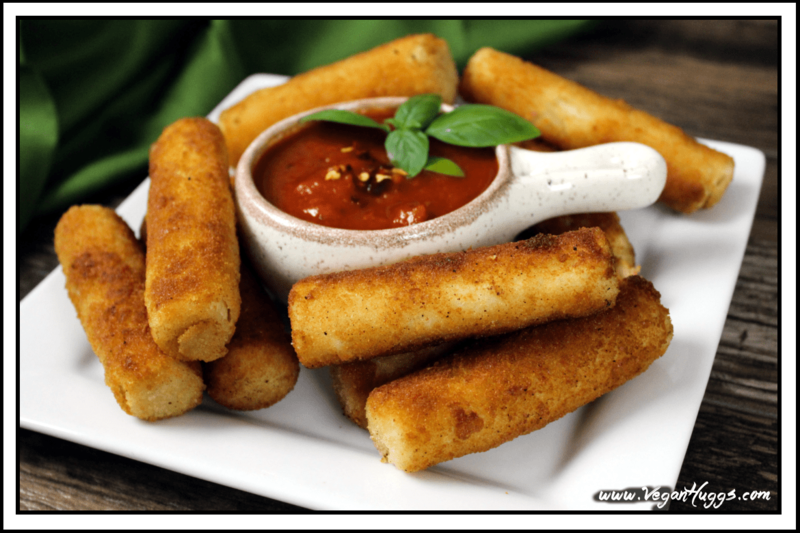 Mozzarella sticks were my favorite junk food growing up. I’m sure I am not alone with this one. They were crunchy, stringy and yummy! Every restaurant that I visited had them and I ordered them religiously. They were quite addictive and filling and I’d usually get full before my meal arrived. I had no idea how bad cheese was for my body and how cruel it was. Now, I can still enjoy these fun snacks without all the junk with these Vegan Mozzarella Sticks. For this recipe, I used hearts of palm as the cheese substitute. I know it sounds crazy, but it works well, I promise. When breaded & fried, they get a little stringy inside. No, it’s not exactly like cheese, but it’s just as delicious. Also, they have a hint of tang, just like cheese. Fried food, in general, is not healthy, but this vegan version is worlds healthier than the deep-fried cheese version. Also, a lot kinder, too. When I purchase hearts of palm, I look for labels that say “sustainably harvested”. This way, I won’t be contributing to knocking down whole trees. 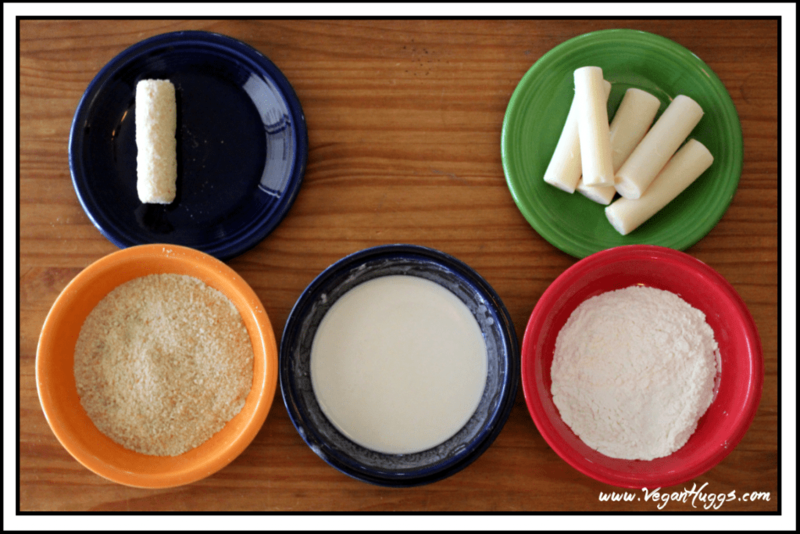 Hearts of palm can be cultivated from a base plant… it has many branches & can be cut without killing the tree. This allows other branches to continue growing. I buy Native Forest, but there are other companies using the same practices. 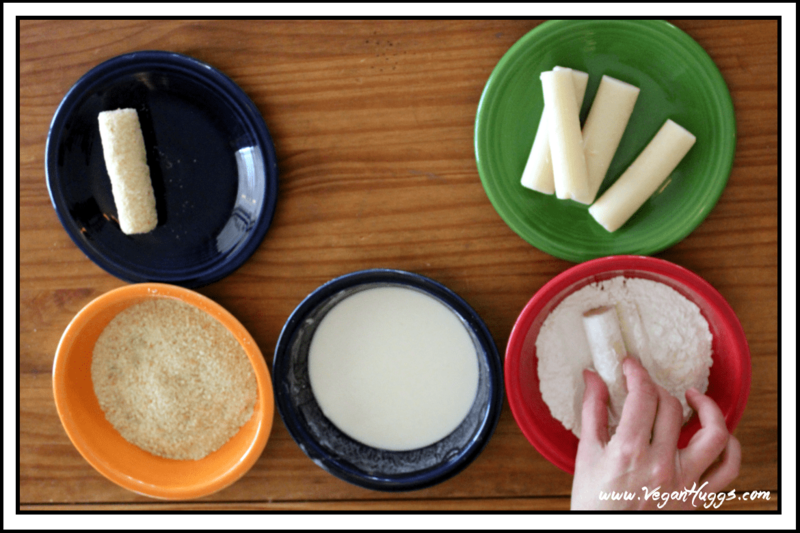 Ok, let’s get started on these Vegan Mozzarella Sticks! 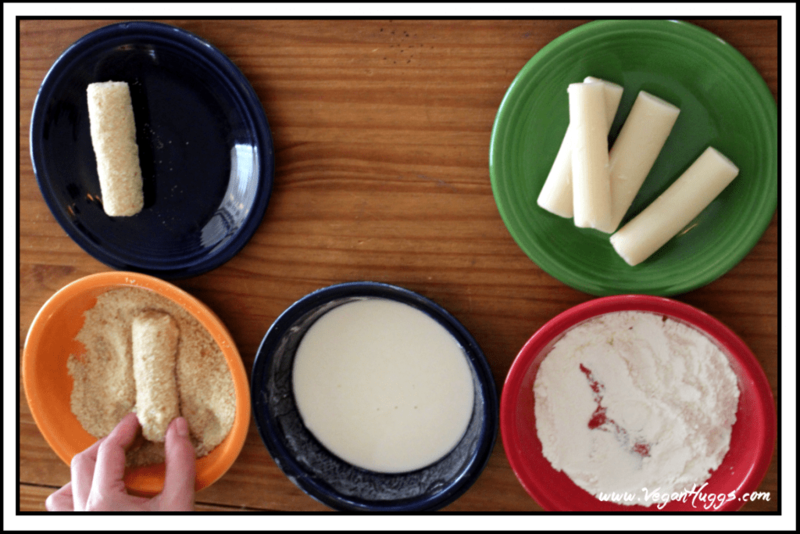 Prepare your breading station by placing 1/4 cup flour in a bowl or a plate & set aside. In another bowl, place 1/4 cup flour and 1/2 cup water together, mix well & set aside. In a third bowl or plate, mix bread crumbs and salt together, set aside. Dry the hearts of palm with a hand towel to remove excess moisture. 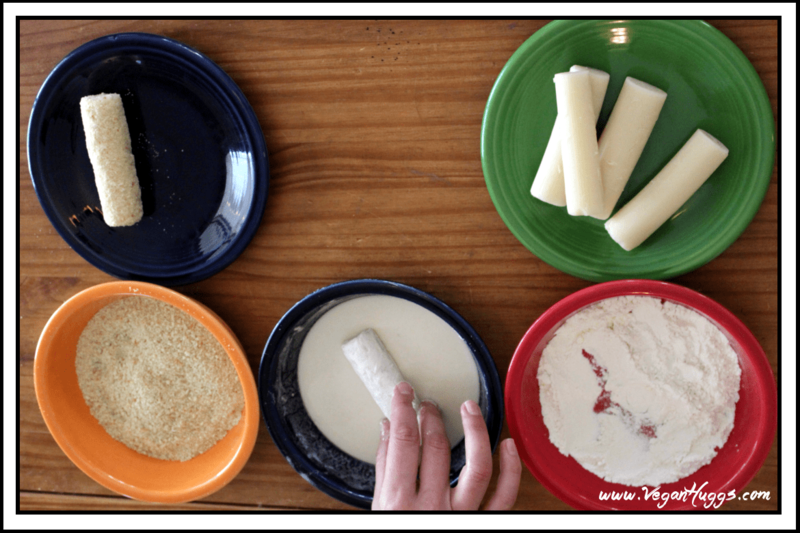 Next, place a heart of palm in the flour bowl and dredge. Then place it in the batter mixture and cover all sides with batter. (allow runoff batter to drip back into the bowl when removing). Next place the battered heart of palm into the breadcrumb bowl. Roll around and press, until completely covered in breadcrumbs. Place oil in a large pan over medium heat, until hot. You can test it by placing the edge of a breaded heart of palm in the oil, to hear if it’s ready. If it sizzles, you are ready to start frying. When done, place on a large plate with a paper towel to absorb excess oil. Enjoy! 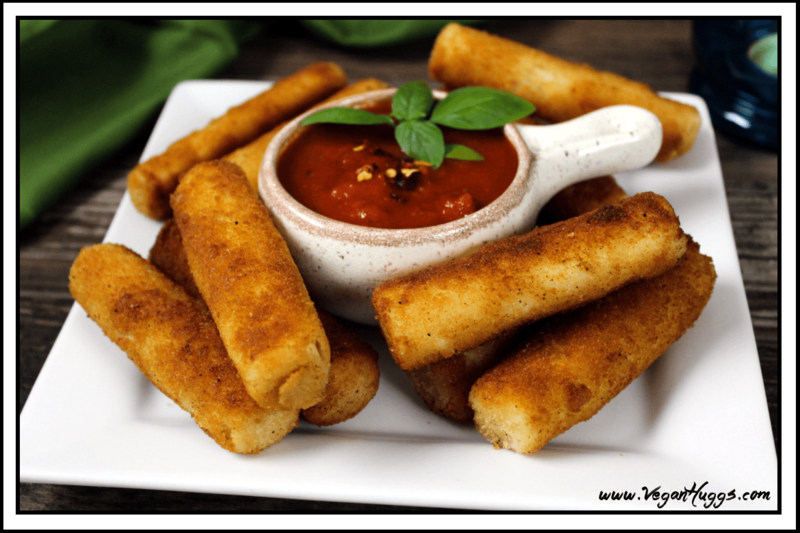 If you make these vegan mozzarella sticks or one of my other recipes, I’d love to hear from you. Leave a comment below and let me know what you think. It would really make my day. You can also follow me on Instagram and share your creation with me, Just tag me @veganhuggs and hashtag #veganhuggs. Next place the battered heart of palm into the breadcrumb bowl. Roll around and press, until completely covered in breadcrumbs. Repeat until all hearts of palm are breaded. When done, place on a large plate with a paper towel to absorb excess oil. Serve with your favorite marinara sauce. Enjoy! *If the batter is too thick, a little more water can be added. One teaspoon at a time. I have actually made these before!! They are so yummy! I commented on hearts of Palm years ago to my friend saying they taste just like string cheese and texture. I’m not veagan or anything but she is and she took the thought and breaded and fried the suckered and they were great! Ingredients different but amazing! She has a blog with it her recipe too. Thanks for sharing. I’ll have to taste test and compare. I have to say these were amazing! I think cheese was the hardest thing to give up when I started my plant based lifestyle and now with these Mozzarella Sticks I feel like I can make it. Thank you for this recipe. I have already shared with other family members who have also changed to plant based. I am speechless. Thanks for sharing this recipe. 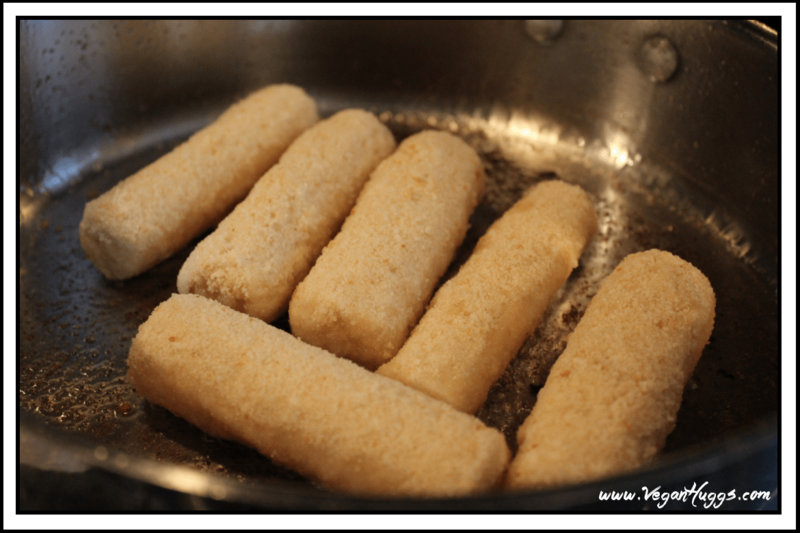 Who wasn’t addicted to mozzarella sticks?! I need to find out where I can buy or order the hearts of palm in Germany. Hi Jasnin, Ahh, thank you for the kind compliment. I used to big a fan of mozzarella sticks too. These are a fun replacement. I hope you can find them in Germany. Can you order from Amazon? If you are newly vegan and remember the taste of mozzarella sticks you might be disappointed with these. But if you aren’t trying to directly compare, these are a tasty treat! Such a good flavor and even though fried, much healthier than mozzarella! They look so pretty, too! I fried these in my deep fryer and they were quick to make! Would they bake well? I don’t use oil. hi, I am really curious to try this recipe. However, I do no t get how the ” cheese” flavors introduce to the recipe to call them Mozzarella…maybe we can add notch to the crumbs? These were so good! Super easy to make. They didn’t taste like mozzarella but they had a wonderful taste of their own. Thanks for the recipe. I have got to try these! They look perfectly delicious and crispy! I just wanted to thank you for the recipe. A huge hit, even with my 12 year old. I always enjoy finding recipes I don’t have to alter in regards to food allergies). In the panko crumbs, I added garlic salt & Italian seasonings. I also decided to slice each piece lengthwise to double the amount. I used avocado oil and an iron skillet. They were great with just a little lemon squeezed on them or marinara. Looks delicious! Where can I buy hearts of palm? I live in Massachusetts? Thanks! Thank you, Anna! Heart of palm is also great on salads 🙂 You’ve got to try them. These are interesting and look yummy. They have officially been Pinned :). I can’t wait to try them! Thanks for the recipe!